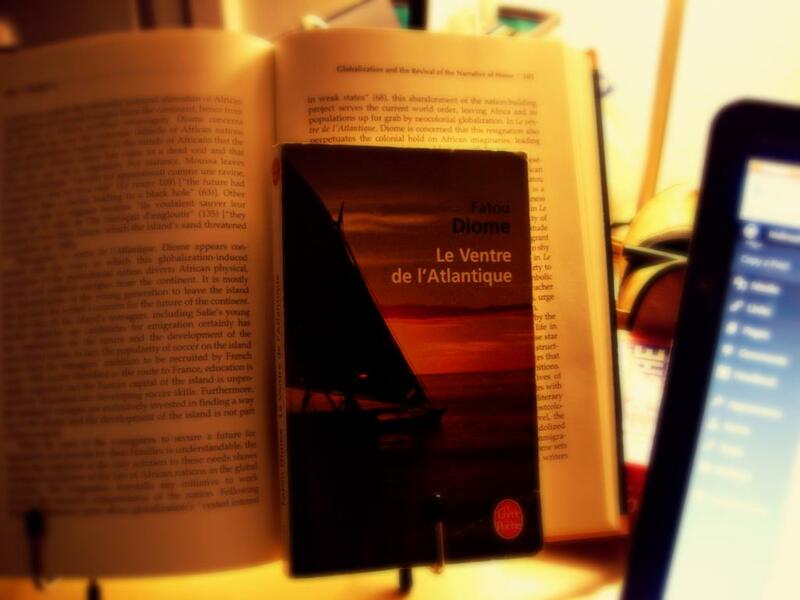 Diome’s novel Le Ventre de l’Atlantique portrays the ambivalent relationship of Salie, the female protagonist-narrator, toward her homeland, the island of Niodior off the coast of Senegal. Rejected by the society in which she was raised, she moves to France, placing herself in a state of exile. Yet she continues to long for a home which will not embrace her. According to Coly, there are two narrative strategies throughout the book – the first, in which she recounts her estrangement from Niodior, and the second in which she nostalgically longs for it – the latter of these placing her in the prototypical position of exile (Coly, 120). While she refuses to return home permanently, she counsels her teenage brother and all of his friends to stay on the island and work to improve its economy. Coly sees this as a gesture of antiglobalization and one that enforces the project of nation-building. The problem I’m having here is what happens in that “and“… She is absolutely right that the reach of globalization into the African state “perpetuates the colonial hold on African imaginaries, leading young Africans to associate good fortune with France” (105). But I’d like to argue that Diome is less concerned with nation-building than with the thriving of local communities within the nation. 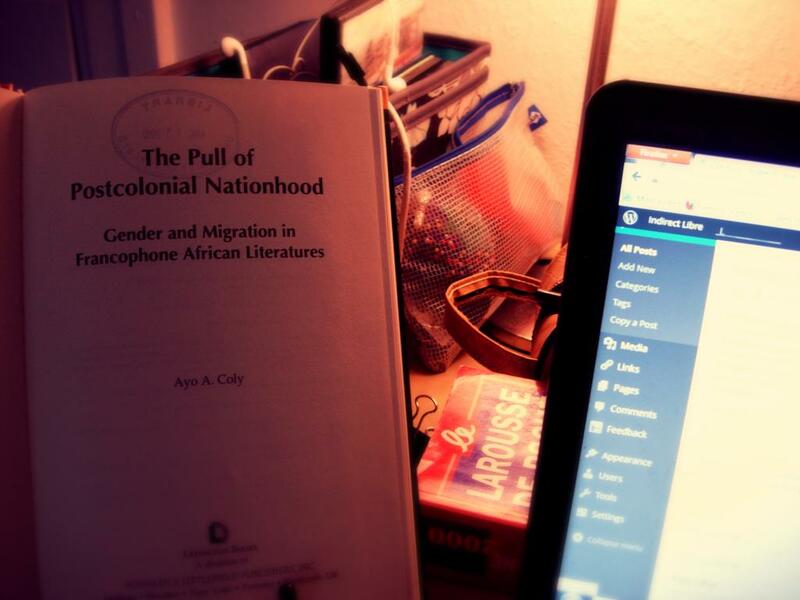 Coly claims: “Having established the embattled sovereignty of the postcolonial African nation and the ensuing vulnerability of African bodies under globalization, the resulting situatedness of Fatou Diome in an anticolonial and nationalist narrative of home is a political and ideological inexorability” (105). However this nationalist narrative is not so inexorable as it might seem. Throughout the novel, Diome’s narrator specifically cites, once and again, the removal of the island from the nation. The sense of separation, the sense of floating out in the Atlantic – this does not reinforce the concept of participating in a nation at all, the island barely participates in the continent. In one particularly telling passage, she asserts that the island would likely have enough groundwater flow to irrigate the whole of Senegal but the country would never know it because its government has simply forgotten about Niodior altogether. This extremely cynical portrayal of the nation is not at odds with a hopeful portrayal of the island, and the importance placed upon improving its economy. Diome’s work is a fascinating example of commentary upon the importance of developing local consciousness, and this consciousness should not be so quickly absorbed into a portrayal of nationalism simply because critics of African literature are worried about the nation losing its grip on the imaginary of cosmopolitan African writers. The local is spatially relative, but the nation is not. The nation is a product of delineation, of lines drawn on a map. It can, of course, be more than this, and it can be an extremely potent working structure of the imaginary. But it cannot be equated with the national simply because it is not the global. It is not wrong to assert that writers should not lose sight of the nation. What Diome so effectively reminds us is that this should not come at the high cost of seeing the local.